Follow this link to learn more about the Animal Rescue and follow us on facebook. 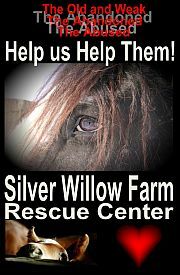 Please consider a donation to help feed and care for the animals. This show takes place on the beautiful Silver Willow Farm and has something for everyone! The Whole Family will have Fun! This admission includes one free show class of your choice. Additional classes may be entered that suit your vehicle for an additional $10.00 per class. All classes are tropy classes. THIS IS A "NON ALCOHOL" EVENT. Anyone suspected of being impaired will not be allowed to participate in any performance activity. Coolers are welcome, but NO GLASS allowed on the farm. Please keep your beverages at your campsites. It is suggested to you that you pre-register in advance of the show to ensure your camping trailer site. Please click here for Camping Registration Form page. Mail, Email and E transfers accepted. Information is on the printable version. There are NO serviced sites. Totally rough camping only. We THANK YOU for keeping the farm clean and safe and appreciate how everyone always takes their garbage home for disposal. THANK YOU for doing your part to make sure this family event can continue for many years!!! Please remember…..This farm feeds many mouths and these fields you are playing on this one weekend of the year, are actually feed crops. Damaging the fields takes food away from the farm and reduces our ability to feed the animals. Campers may move in anytime Thursday and welcome to stay for up to 4 days. Motorhomes and trailers sites are on the highest ground. Tent and Under the Stars bush edged sites will be filled first come first served. Limit of 2 vehicles per site and 4 people per site. All campers MUST have weekend passes. No camping in show fields. Please be especially careful with garbage of any type. Plastic, glass, metal, etc. will kill our animals if consumed in the feed. Please take your trash home. This is NOT the city. We have no means of disposing of your garbage. NO GLASS ALLOWED ON THE FARM PLEASE! The Bandstand will be centered in the Food Garden. Bring your Sunbrella and Picnic blankets and lawnchairs. CHAMPLAIN CATERING will have plenty of good food available all day and into Saturday evening! Breakfast will be available Saturday and Sunday morning. The CAMPERS SPECIAL BONFIRE CONCERT Show begins at dusk on Saturday evening and you really won't want to miss it! GREAT COUNTRY MUSIC! Be sure to bring your dancing feet!! The Show is FOR CAMPERS ONLY and no one will be admitted after dusk. The stage show is included with your weekend CAMPING PASS. Your Pass must be worn please. So if you want to join the party on Saturday night, you MUST be a registered camper. The Silver Willow Classic Show ia a Judged Show Competition awarding beautiful and coveted limited-edition Collector Trophys. There is a complete full line of judged classes for everything from Original Antique Cars and Trucks from our past to today's high-performance Diesel Pullers and Commercial Haulers. The SHOW N SHINE CAR and BIKE, TRUCK and ATV CLASSES will be judged on Saturday Only. Cars and Bike, and Truck and ATV Show n Shine trophies will be awarded on Saturday at Approximately 6:30 pm. NOTE: PLEASE ENSURE that ALL PERFORMANCE and RACE VEHICLES are entered in the SHOW N SHINE CLASSES . The judges will do there best to get them judged prior to your race classes. Please ensure they are clean enough for the judging. Registration opens both days at 8AM. Judging starts at 2 pm on Saturday and will continue throughout the afternoon until approx 4pm. We respectfully ask that vehicles do not leave the grounds until they have been judged. All judged vehicles will be identified as “JUDGED” after their inspection. Please make arrangements with a friend to pick up your trophy if you cannot be here yourself, as they are too large to mail. We will happily hold them for PICK UP at the farm at a later date. More details are available on the Class List Page. Click HERE for the Class List. Each class will be assigned by tire size to be determined the day of show. ALL ARE WELCOME to participate. MUST have WORKING BRAKES AND their own appropriate-sized TOW STRAP ATTACHED. No tow strap attached.....no run. IMPORTANT: ALL DRIVERS MUST HOOK THEIR OWN VEHICLE FOR PULL OUTS. ALL DRIVERS and PASSENGERS must wear safety helmets . All participants in the performance events MUST SIGN liability release prior to entering the pit or Obstacle Course and wear arm band supllied for identification. Entry fee is $10.00 per class. First class is free with your paid admission to grounds. A Quad Bog and Truck Bog Competition runs both Saturday and Sunday. MUD RACES start at 11AM both days. Drivers meeting at 10AM both days. SHOW N SHINE QUADS, MUD TRUCKS AND OBSTACLE CRAWLERS will be judged prior to their performance competitions early Saturday morning. PLEASE MAKE SURE YOU ENTER YOUR CLASSES Friday evening or early Saturday morning. ALL Performance Vehicles MUST display their show number on the Right side drivers window. Unfortunately, someone did not respect our "DOGS MUST BE KEPT ON A LEASH POLICY" and one of the innocent rescued animals paid the painful and tragic price for her deliberate disregard for our simple and logical request. We love all animals on this farm but non-farm dogs are very dangerous to our animals. Even the smallest dog can cause a great amount of harm on the farm. If any dog is caught off leash, the owner and dog will be escorted off the farm. NO EXCUSES! Please respect our farm animals and keep them safe. Keep your pet on the leash and in your hand. To become a Sponsor,please Contact Us.